(5 Customer Reviews) | Write Review 12 issues per year If you are a modern knitter wanting patterns that are not just fun to make but fashionable too then Let’s Knit is the magazine for you! 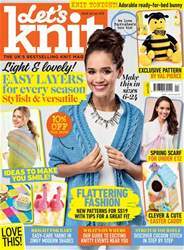 It’s packed with projects for all skill levels, along with technical tips, entertaining features and the hottest products for knitters. Let’s Knit has exclusive patterns from some of the best contemporary designers, with clear instructions presented in a fresh, accessible format. Each issue features garments, accessories, homeware patterns, quick knits and patterns for babies and children from some of the best contemporary designers. With clear instructions presented in a fresh, accessible format, this download offers more of what knitters want – more patterns, more style, more shopping, more options and more inspiration! Looking for Let's Knit in print? Unfortunately pocketmags.com does not sell print copies of Let's Knit, but all is not lost. Our partner at magazine.co.uk sells print subscriptions at the best prices online. • Check out the LK dream home, packed full of knitty goodness! 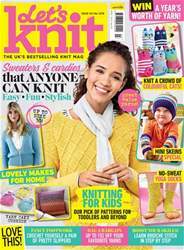 If you are a modern knitter wanting patterns that are not just fun to make but fashionable too then Let’s Knit is the magazine for you! 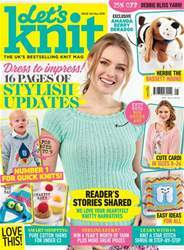 It’s packed with projects for all skill levels, along with technical tips, entertaining features and the hottest products for knitters. You'll receive 12 issues during a 1 year Let's Knit magazine subscription. Love this publication - great patterns and much easier to use than the paper version. I love the magazine and subscribe to it. Lovely patterns and cheaper than the shops. Even though you don't get the free kits you can still getmost patterns free online from them or through facebook. Also you have all your magazines in one place forever! No trying to find them down the back of the wardrobe. I enjoyed the information and patterns however I do not do enough knitting to continue to subscripe. I will however consider buying additional project books. 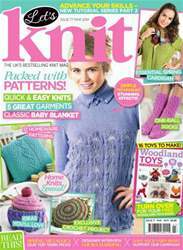 You'll receive 12 issues during a 1 year Let's Knit magazine print subscription.